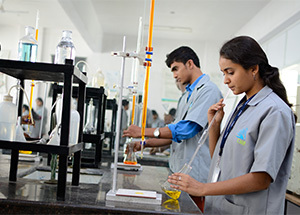 The Department of Chemistry is one of the earliest established departments at CMRIT. The Department primarily focuses on teaching Engineering Chemistry as part of the first year foundation courses for students of all branches of engineering. Many engineers find that the study of Engineering Chemistry is an essential skill that helps strengthen their theoretical fundamentals in the subject and enables them to develop an understanding of the practical applications of chemistry in industry and engineering. The Department has qualified & experienced faculty, state-of-the-art infrastructure, and is actively involved in basic and applied research work. Most of the staff members are Doctorate holders from NCL, IIT (Mumbai), Indian Institute of Science (IISc, Bangalore) and Bangalore University. The Department has expertise in the preparation of Nano materials, Photo catalysis, Biosensors, Solid oxide thin films, BioInorganic chemistry. The Department continues to prove its achievements in the area of research through ongoing publications in National and International journals, books, inventions and patents.